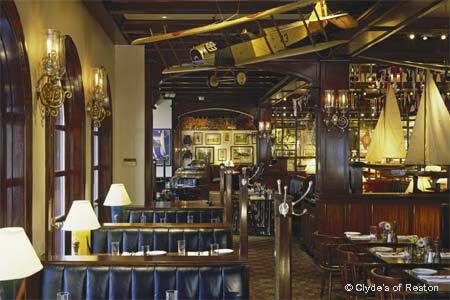 Perennially popular bar scene; seasonal and standard American dishes. : As the quintessential neighborhood restaurant-bar-hangout, this Clyde’s hums with activity and buzzes with conversation almost around the clock. Want a casual Sunday supper? Drop in for an entrée salad. Stopping by for lunch with friends? How about a bowl of chili and one of Clyde’s burgers? A drink or two after work? The bar scene jumps and swirls. And holiday meals throb with the bustle of family and friends gathered together to celebrate. As with all the Clyde’s restaurants, the menu has several mainstays --- crab cakes, artichoke dip and burgers, to name a few --- but also keep an eye out for some twists the chef presents for the day. Maybe it’ll be a frittata with chorizo or to ward off a cold-weather chill, a portion of Guinness beef stew. The brunch menu offers such original dishes as the chorizo and polenta with a poached egg or a classic Monte Cristo sandwich. For warm-weather alfresco eating, nothing around beats Clyde’s open air-yet-covered dining terrace adjacent to the ice skating rink-entertainment pavilion.